Peter Bryer: Mobile Foresight: Microsoft’s chicken-and-egg problem. 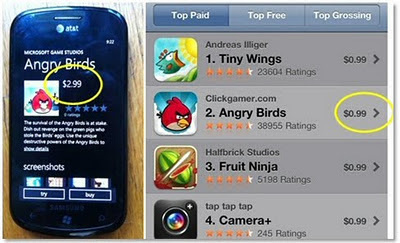 Angry Birds for WP7: same great taste, three times the price. Microsoft’s chicken-and-egg problem. 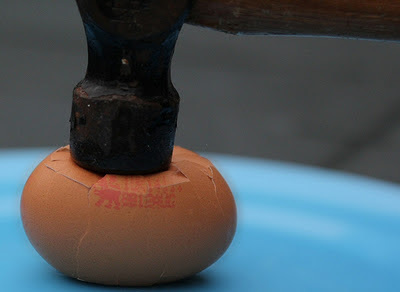 Angry Birds for WP7: same great taste, three times the price. Would you pay $30 for an album at a certain mall you could easily get for $10 at a different mall? Such an expensive mall is likely to be rather empty. This is a tough one for Microsoft and Windows Phone vendors to solve: the small installed user base of WP-based phones means application developers need to charge higher prices for the same apps that are found on Apple’s iOS app store. This makes the ecosystem that much less attractive for consumers, and, in turn, less attractive for developers. It’s a vicious cycle. Over the lifetime of a device, this could be meaningful for the more engaged users. With all the yap about the importance of ecosystems, I see a disconnect here. This is a tough one to crack. But it’s clear that someone is going to have to take a hit to get things going in the right direction. I’d say it’s time for Microsoft to get cracking. MS strategy gurus at work here... "Let's spend our huge stockpile of cash on acquiring Skype, but let's not subsidize our app-store!" Microsoft had better do something. I don't doubt that Windows Phone will succeed at some point, but looking at the platform market share figures for Q3, Microsoft is a spec of dust as they reached another absolute low after a year of Windows Phone. This must be discouraging for WP developers. Well, Q4 2011 and Q1 2012 will be very interesting quarters for Windows Phone and WP vendors.